Getting rid of rats from your chicken coop: a complete guide. 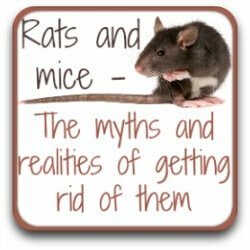 A complete guide to getting rid of rats - forever! Rats in the chicken coop are a risk. Extermination sounds cruel, but is essential for your flock's health - and yours. Please note: Backyard chickens and rodents do not automatically go together. This page and others on the same subject are there simply to help you know what to do should you discover a problem. Good husbandry is very important - and very effective - at keeping vermin at bay. Get rid of them first, and then make sure they don't return by getting rid of uncovered grain! 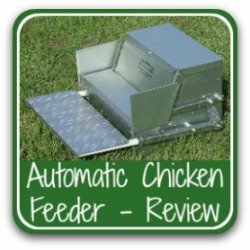 See my review of an automatic feeder which can help. This article covers the ten most common methods, my personal experience of some of them, and the pros and cons of each. My aim? To help you decide which one is best for your circumstances. 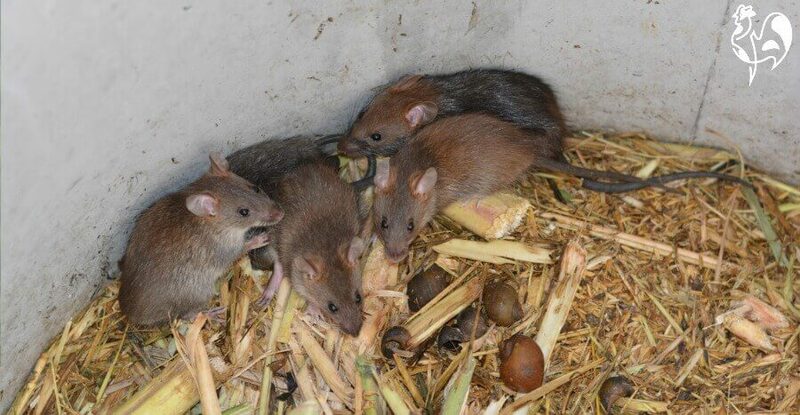 Having rats in the chicken house is something no-one wants to see. And telling the difference between rats and mice is not always easy. It's tempting to see evidence and think "It's only a little field mouse, what harm can he do?" I was so sure I could never have a rodent problem, so convinced it was just one little weeny mouse who just needed a bit of warmth in the winter. So by the time I accepted I had rats in my coop there was an infestation of three separate nests, which proved incredibly hard to deal with. Please - learn from my mistake. Don't leave it. As soon as you see any evidence - take action! It's not pleasant, but it must be done. The question then is: how? Let's look at the options. I'm neither advocating nor opposing any of these methods, with one exception. I'm just outlining the most common methods of rodent extermination and assessing them. Some I have used personally, others I have discussed with rodent control officers in the UK. Different procedures will suit different situations and different people. Not everyone will be comfortable using the same methods. Your job is to gather all the information on each method and then make a judgement for yourself as to which would suit you, your family, your situation and your chickens. This is a long article. If you're particularly interested in learning more about one method, click the links below to go straight to thhat section. 1. Getting rid of rats with poison. An effective means of extermination, but not a long-term solution. I needed to use rat poison because the rodent infestation had grown so large by the time I recognised it that any other, longer-term way would have been potentially putting my chickens at risk of disease. Rats multiply very quickly. But poison really should be a last resort. It's an unpleasant death for the rat, potentially dangerous for pets, livestock and people and not a topic to be taken lightly. For that reason, I've given the use of poison an article all of its own. Find it here. 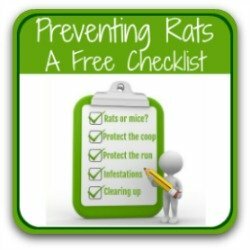 This is second on the list because it's the method I have used ever since I managed to bring the infestation of rats I had under control. These traps are powered by battery. The rat, enticed into the box by a yummy treat, steps on a metal plate. This triggers an electric shock which kills instantly. The main advantages are that it's relatively quick and the rat is killed without blood being spilled, which makes cleaning up easy. 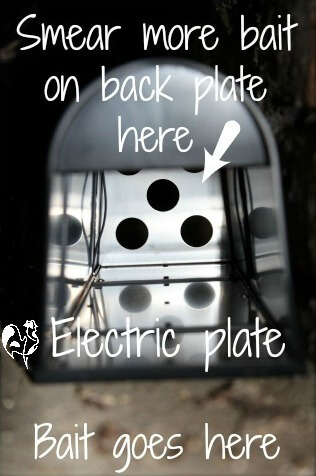 It's also impossible for pets or poultry to fit inside, so they're safe for other animals. And they don't harm the environment. For those reasons, this is my preferred method of rodent control. I've found these traps very effective for controlling both rats and mice - in the house and garage as well as in my chicken coop. 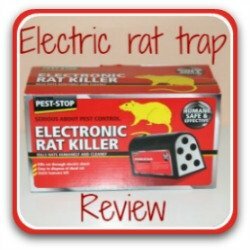 I have written a very detailed review of electronic rat traps, to help you decide whether it's a good method for you. See my electronic trap review at this page. (Links in this section are "affiliate links", which means that if you click and buy something, I earn a small commission at no extra cost to you). 3. The old favourite - snap traps. Quick and effective, but messy. Set in places where you know the rodents are moving, usually around the edge of a run or an outbuilding. Place them well out of the reach of your children, chickens or other animals. Leave them there for several days un-baited until the rodents get used to them. Rats are cautious creatures and won't go near something new and unknown. Cheese is the accepted bait, but try baiting them with peanut butter - really! Rats are very attracted by the smell and you'll only need a tiny smear. Cheap, easy to set and very quick to kill, so the rodent doesn't suffer unduly. Due to their small size, these are better suited to mice than rats. Having to empty the traps of decapitated creatures. No matter how much I dislike vermin - and trust me, I do - this is not a pretty way of dealing with them. 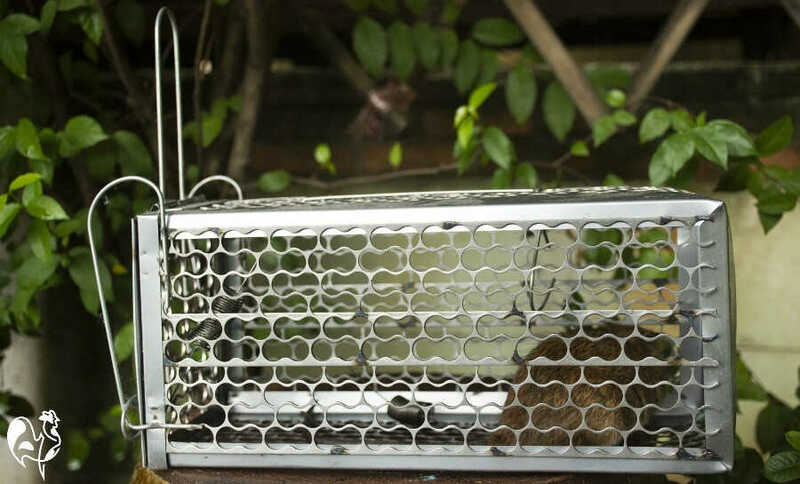 Rodents are actually intelligent animals and will learn not to go near traps which they've seen to be harmful to their community. You need to move them around often. Kind - but the rats may well return. Our neighbour uses this kind of trap. The rodent is caught inside, triggering the door to close. The rodent then has to be re-located. The best humane traps are made of metal. You'll find information on making them from plastic bottles on the internet, but even mice can gnaw through a bottle on a matter of minutes. Rats will take seconds. If the idea of killing any living being is difficult for you then this is the only real option. Doesn't harm either the rat or any other animal which happens along. You end up with a live rat on your hands. Now what? Rats are territorial animals. Once they set up home they like to stay there. So the likelihood is that if you release the rats anywhere close to your coop, they will return. Advice is to take the rat at least five miles away from its nest before setting it free. Even then, there's nothing to say it won't find its way back. And you may just be re-locating the problem onto someone else's property. 5. Exterminating rats a priority? Get a cat! Not an option for everyone - and you need the right kind of cat! This is third on my list because it's another option I've found which is very effective, particularly when combined with the battery operated trap (see here). I live in rural Italy where feral and semi-feral cats are common and, because we have wheat and sunflower fields, we also have mice which attract feral cats. When a mother cat had her litter in our shed, then, I had no problem in inviting them to stay. Good decision! 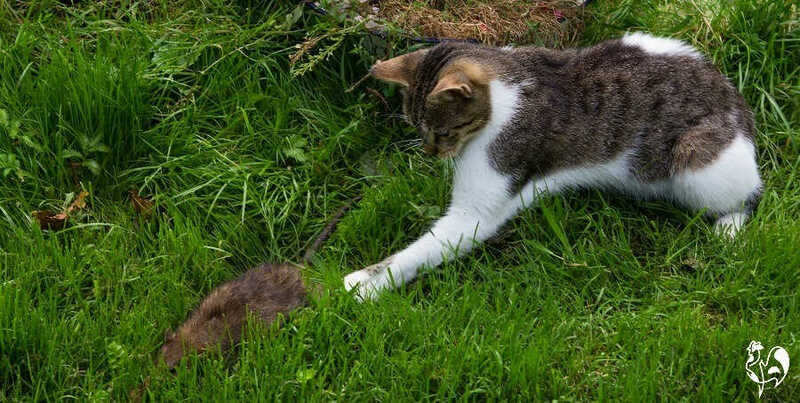 If you're thinking of getting a cat to keep control of the mouse or rat population it really needs to be a large feral or barnyard-type animal which is used to living outside and has been taught by its mother how to tackle the problem. Most smaller, domesticated cats are unlikely to have the courage to take on a full-grown rat. Be careful, though, about how any cat reacts with chickens. It's fairly common for cats to kill baby chicks - after all, to a cat they look just like birds - and some will even take on full-grown hens. Good solution for farmers - but you need a friendly local terrier owner! I used to work in an old, overcrowded Victorian prison in northern England. There was a massive problem with rodent infestation because the drainage system was old and over-used. The prison authorities dealt with it by paying the local Border Terrier and Jack Russell Terrier clubs to come into the prison once a month, after dark, and let their dogs loose in the yards where the rats were running. Watching the dogs 'at work' was mesmerizing! This is a fascinating video by the BBC, showing terriers killing rats on a farm in the UK. If you're at all worried about this method of getting rid of vermin, please - don't watch it. Terriers are bred for this kind of work and love doing it. It's a quick death for the rat - the dogs are fast to catch them and shake them to death. This is a process still used on many farms where these dogs are kept for this specific purpose. Very effective in the short-term. Needs doing regularly. The dogs will only catch rats which are running, so babies will be left in the nest unless it's found and cleared. You need to find a terrier owner or club near you! Not a method I have direct experience of, but if you're a good shot and have time on your hands this may be an option. Is it legal? And how does it work? Yes, it's perfectly legal. Although in Europe personal use of firearms without a certificate is illegal, it is perfectly legal anywhere to shoot vermin, as long as it's on your own land and using an air rifle. If you have permission, it's also legal to shoot rodents on someone else's land. Some famers advocate this as a quick and humane method, particularly when the rats are trapped in a barrel in a dry version of the 'walk the plank' trap (see below). Rats trapped in a cement well - literally a sitting target. Another way of keeping the rats in one place is to lay bait down. Either peanut butter or diced up cat food works well, in my experience. Rats generally like to come out at night, so you need to set up just before dusk to be most effective. Shooting by artificial light isn't a good idea - the rats will simply remain in their nest. Amusing to read about, not so amusing to use. 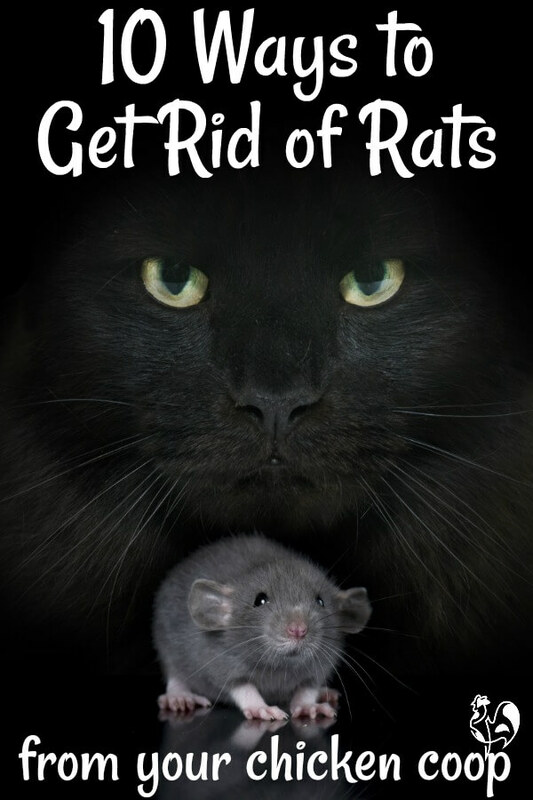 Search online for 'homemade ways of getting rid of rats' and you'll find all kinds of ideas. Some are dangerous, some imaginative, some downright quirky. One of the most common is the 'walk the plank' option. Take a barrel, fill to about 6" with water. Add some grain. On top of the barrel balance a plank, one end hovering over the centre of the barrel. Add a smear of peanut butter at the edge. The rats 'walk the plank' to get to the peanut butter, topple into the water and drown. Inexpensive (providing you have a barrel). Unpredictable - you need to be sure the plank will stay in place. Inhumane - it will take several minutes for a rat to drown. Not very effective, according to people who have used it. This is the only method which I categorically say do not use. I've seen these used in a workplace which became over-run with mice. It was inhumane and cruel. Used mainly by commercial companies because they're cheap and very effective. They're literally pads of glue which are set in rat-run places. When rodents - or anything else - moves onto them, they find themselves stuck. The animal either dies from exhaustion trying to escape, starves to death or has to be killed manually. They catch anything moving across them, including insects and birds. If the animal doesn't die from exhaustion or literally tearing itself apart trying to escape, you will have to kill it. I don't normally recommend or oppose any method but I would have to say, having seen these first-hand, that I do not think they should be used. Ever. Yes, rats are not welcome. 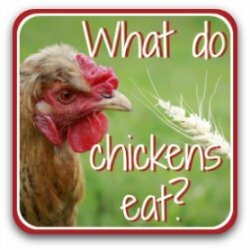 Yes, getting rid of vermin is vital to your chickens' health - and your family's. But there are more humane ways. Wishful thinking - these may work on bugs (although even that is questionable) but there are no scientific studies at all which have found them to be effective in getting rid of rats and manufacturers have been repeatedly warned not to make false claims by the Federal Trade Commission of America. 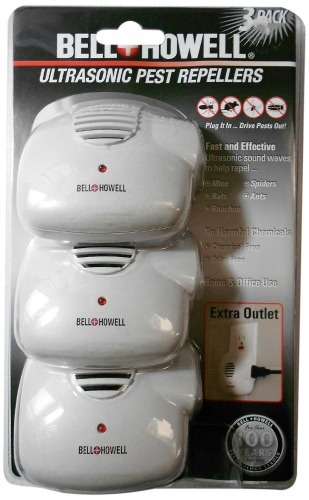 Ultrasonic repellers are small devices which plug into an electric socket and emit a very high pitched noise which is not heard by the human ear, but which rodents - supposedly - dislike. Some are relatively inexpensive (although some are very expensive). Some people swear by them, particularly to deal with roaches and other bugs. Once you already have an infestation of rodents these will be completely useless. Communities of rats will not be put off staying in their comfortable nest by some high pitched whining. At best, if you're looking for something to deter rats and mice coming into your property, they may be worth trying before you try anything else but be warned - there are no studies whatever saying they have any effect on getting rid of rodents. My own experience of using them in my house to deter tiny fieldmice bears that out - they just didn't work. Please note: Because I undertake only to promote products I think will benefit you, and I have no evidence that these are worth spending money on, I am not providing a link to buy this product. However, if you want to give them a try, they are readily available on Amazon. 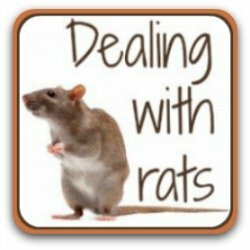 There are several other articles on my website about getting rid of rats and other rodents which I hope you'll find useful. Click on the pictures to go to whichever you think might help.